Every spring I scout my yard for garlic mustard. I found several rosettes last weekend, which I promptly removed. I have many spring ephemerals in my wooded areas, and garlic mustard is a danger to them. 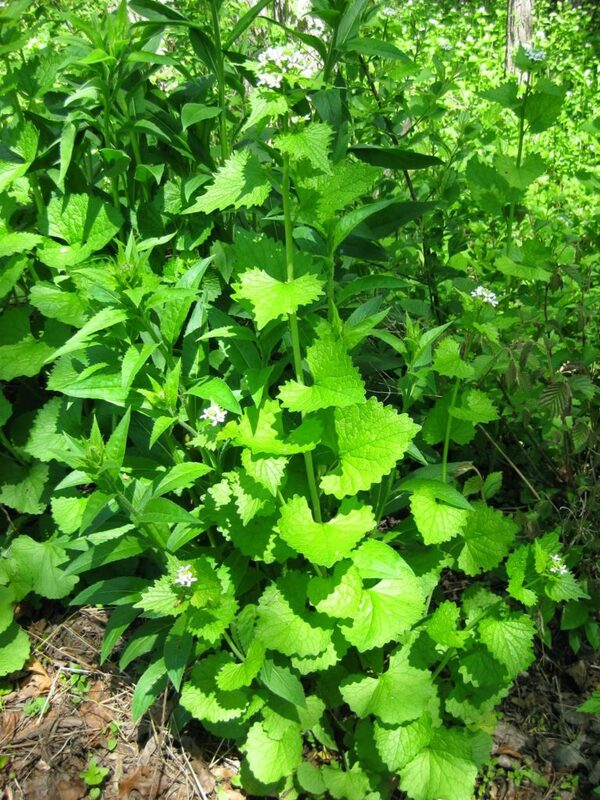 We have battled garlic mustard at Rotary Botanical Gardens for many years. We have won the battle in most of our beds, but more natural wooded areas like the North Path continue to be a challenge. 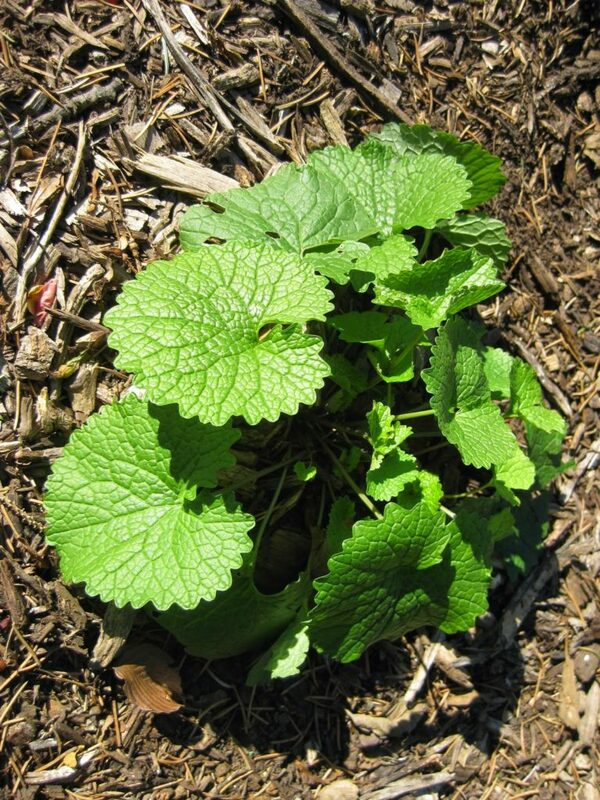 Garlic mustard was brought over from Europe by early settlers for culinary and medicinal purposes. Unfortunately, it’s thrived too well here and has become an aggressive weed. It blooms very early and smothers out native wildflowers and tree seedlings. Its roots produce an allelopathic chemical that inhibits growth of other plant species. It grows well in shade or sun. Garlic mustard is a member of the Brassica (mustard) family. Its name, Allaria (from allium, Latin for garlic), refers to the garlic odor of new foliage when crushed. 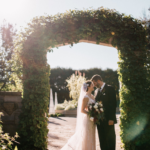 It’s a biennial plant, so in the first year it forms a rosette of round, scalloped leaves, and blooms in the second year on 3- to 4-foot-tall plants. The flower stem has triangular, toothed leaves. Second year flowering – note triangle leaves! 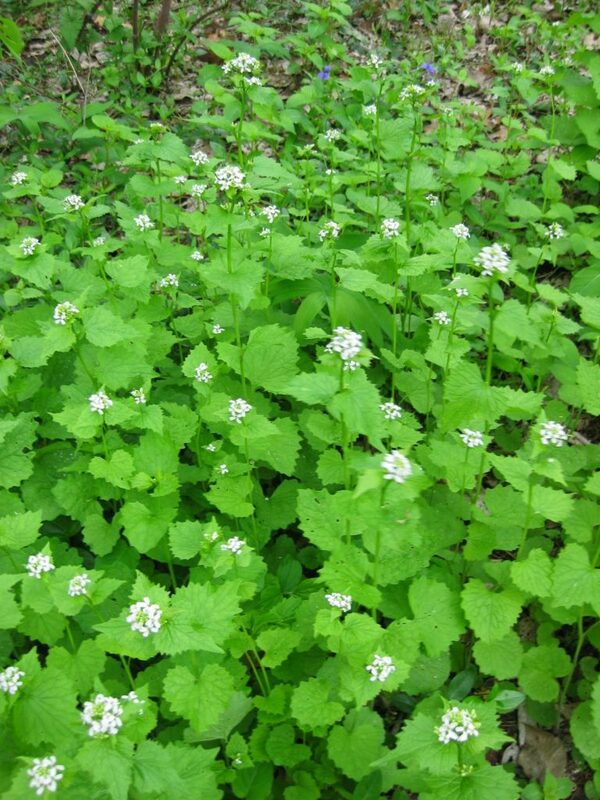 One effective way to remove garlic mustard is by hand pulling in early spring before the flowers have gone to seed. Don’t put these in the compost pile, even if the flowers haven’t gone to seed yet (plants can continue to mature even after being pulled!). Instead, bag up in plastic and put in the landfill. First year rosettes can be pulled anytime. This process may have to be repeated for several years. One garlic mustard plant can produce up to 7,500 seeds, which can remain viable in the soil for up to 6 years! That’s a lot of garlic mustard! For particularly bad infestations an herbicide such as glyphosate can be use, but be careful to apply in early spring or fall when natives are dormant. I’d recommend contacting U.W. 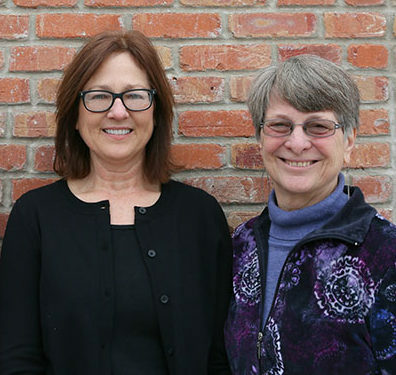 Extension – Rock County or the Wisconsin DNR for more information about safely applying herbicides for garlic mustard control. And yes, you can eat garlic mustard, which is why it’s here in the first place. However, this plant has caused me so much grief in my gardening life that the food riots would have to have started before I’d invite this thug to my dinner table. ← Not Quite “Rained Out”!